For our Second What to Wear Wednesday, I turned to my more conservative side and found some of my favorite items that I wear to the private clubs. Nike Visor: Nice wide brim visor to keep your skin healthy. Click Here to Purchase on Amazon! 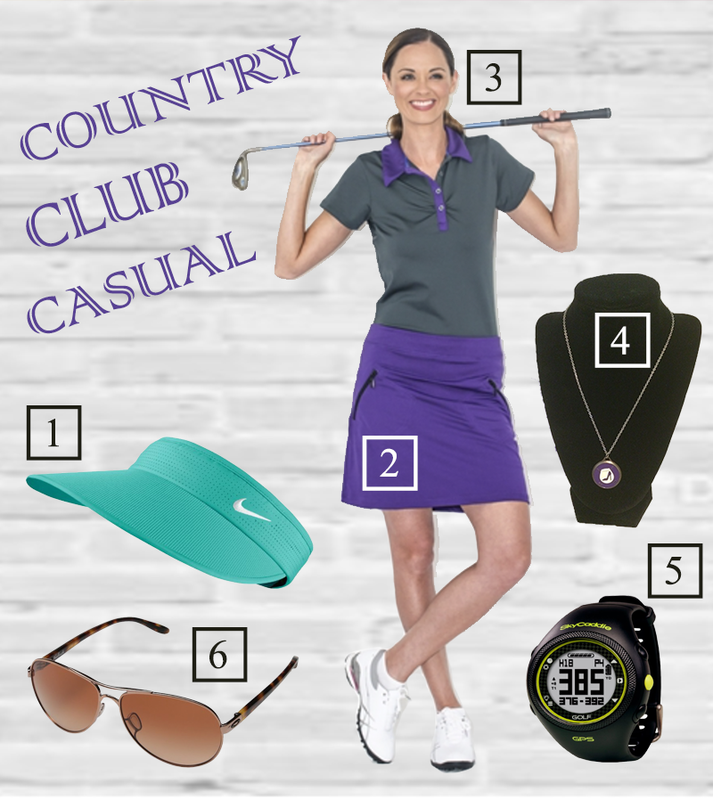 VK SPORT Knit Golf Skort – Plum: The extra length is Country Club Appropriate! Plus this has a luxury knit fabric that feels soft and comfortable both on and off the green. Click Here to Purchase on Golf4her.com and Members get 15% Off their first Order and $20 Off $100 Always! CLICK HERE to become a Member! High Heel Golfer Ball Marker Necklace: This is a staple for your wardrobe in San Diego. CLICK HERE to get one for becoming an SCGA Member. Oakley Feedback Aviator Sunglasses: Love, love, love these sunglasses! First, they actually look good on me – see pic below! And 2nd they are the first wire frame sunglass that are truly designed for the active woman, so when I’m running, they don’t fly off my face! Click Here to Purchase on Amazon! Can you play golf in the rain?